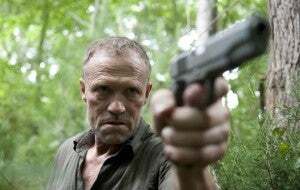 As the episode opens, we see Merle and other Woodbury men walking through the woods. They stumble upon a mess of walker parts in the woods, arranged on the ground in a bloody mess, and at first they try and discern what Michonne might have been trying to do with them. One of the men points out that she has spelled out "go back" in body parts, something that Merle finds amusing. The one who figured out the message (Merle calls him Neil), apparently on his first mission, isn't so entertained and his edginess upsets Merle, who tells the young man that he's in for a rude awakening if he doesn't stop verbalizing his doubts and step up to his responsibilities. There's a noise in the trees, and Merle starts calling to Michonne, challenging her to come out and try to take them on, four-on-one, with all of the men heavily armed. She springs out of a tree, quickly killing two of the men, leaving only Merle and Neil, although in the fracas Merle shoots Michonne in the leg. Neil is left still and shocked by the altercation. Back at the prison, Rick is talking on the phone. The voice is not immediately recognizable, and they won't identify themselves or reveal their location, although they say it's someplace safe. He tells them that he's got a son and a newborn baby and asks if they're willing to take in others. She says she has to discuss it with their group and, despite his pleas not to, she hangs up and says she'll call back in two hours. The group is eating when Rick approaches them, cleaned up of all the blood and gore of the last few days. He says he needs to continue clearing the prison, but that he wanted to check on Carl. He asks for a gun, but the group tells him that they're low on bullets; Maggie and Glenn are going to go on a run soon to look for ammunition and baby formula. With the rest of the group seemingly handling their part well, Rick leaves. In the clearing where Michonne attacked them, Merle returns to recover Neil, who is hyperventilating over the corpses of his friends. After a brief lecture that he has to rise to the occasion, Neil is forced to put a blade in one of the skulls of their friends in order to ensure they don't turn. Within the Woodbury walls, Andrea tells the Governor that she doesn't approve of the arena. It's brutality for fun, she explains, and the world is brutal enough already. She wants to stay, though, and she wants to contribute. She tells the Governor that she'd like to help guard the wall, and the Governor tells her that he'll get someone to help teach her archery. Back at the prison, Rick is waiting by the phone when it rings. He answers eagerly and this time it's a man on the other end. He describes a safe, almost unreal place where there haven't been any attacks, and he asks Rick whether he's killed anyone. Rick explains the (living) people he's killed, including Shane, and the voice on the other end asks how he lost his wife. When Rick replies that he never said he had one, the voice tells him that he's assuming because of the aforementioned son and newborn. Rick, after a long pause, says he doesn't want to talk about it, and the other person hangs up. Rick has a brief tantrum. Back in Woodbury, Andrea bonds with her soon-to-be archery coach, a young woman, about having had to kill family members who turned. When the woman's first couple of arrows fail to take out a walker, Andrea jumps the wall and takes him out with a knife, which upsets the girl. Back in the prison, Hershel approaches Rick. He tells him that he can still feel his leg, and then eases into the fact that Lori was sorry for the affair. He says that while Rick wants to get away from the prison, there isn't anywhere safer. Rick tells him about the phone calls. Hershel is skeptical--not only that the call has come, which is apparent from an attempt to grab the handset, but that it would be safe to try and get there even if the calls are on the level. Rick assures him that if the other place is safer, he'll find a way to get them there, but asks him not to say anything to the rest of the group. Hershel offers to sit with Rick, but Rick declines him. In the woods, Merle and Neil are hunting Michonne when they come to a clearing where she jumps out at them. She slashes Neil and then gets into a brief, brutal fight with Merle but before anyone can be killed, they're all set upon by a group of walkers. Neil saves Merle, who then kills a second, but Michonne has dispatched hers and disappeared back into the woods before the pair can look up. 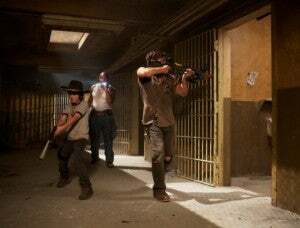 In the prison, Oscar and Daryl are patrolling for walkers. They opt not to kill one or two who are in a cell, with barely any energy to fight, and Daryl joins Carl to tell him a story about how his mother died by drinking herself to sleep with a cigarette in her hand. It's a long, detailed story in which he tells Carl that the hardest part was that she burned away to nothing and was just gone, which made it seem unreal. "I shot my mom. She was out, hadn't turned yet. I ended it--it was real," Carl tells him. "Sorry about your mom." In Woodbury, the Governor is writing in his journal when Andrea knocks at his door. He tells her that they don't need her guarding the wall anymore, and she admits that she liked the fight she had been condemning, but that she doesn't like herself for liking it. He says he knows, and the two have some more flirtatious banter. In the woods, Merle is ready to pack up and go home, saying that Michonne is headed "straight for the rest home--she's as good as dead." Neil objects, saying that they need to pursue her because she killed their men. Merle says that they will just tell the Governor they killed her, since she's as good as dead, but Neil refuses to lie to him. So Merle shoots him in the head. Elsewhere, Michonne is digging a backpack out of the hollow of a tree when she sees a small group of walkers. To her surprise, they all walk right past her, and she realizes that it's because she's covered in the guts of a zombie she killed during the fight in the clearing. Back at the prison, Rick answers the phone again, and it's a woman putting him on the spot about his refusal to be open with the other man. When he starts to soften and offer answers, she calls him by name, which takes him by surprise. When he asks how she knows who he is, she hangs up. As Michonne enters a community of some kind, she behind a car in a parking lot. Elsewhere on the same street, Maggie and Glenn drive into town in a truck. After a brief, romantic moment, the two start looking for supplies. As Maggie encourages him to grab a toy for the Baby Grimes, Michonne looks on. In Woodbury, the Governor and Andrea are sharing a drink on his patio, joking about their lives before the apocalypse. He tells her that she doesn't have to be ashamed about liking the fight--that he loves it. After a bit of conversation, the two begin to kiss. Following a successful shopping trip, Glenn and Maggie are talking about heading home when Merle appears from around the corner holding a gun on them. Seeing who they are, and that they remember him, he puts down his gun and approaches them, all smiles. He's relieved when they tell him that Daryl is alive, and tells Glenn that if they take him to his brother, he'll call it even, leaving no hard feelings over what happened in Atlanta. 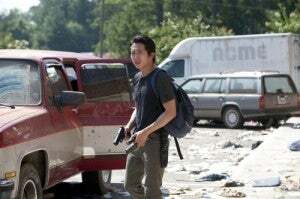 Glenn refuses, saying that he'll bring Daryl back to Merle. Merle shoots out their back window and puts the gun to Maggie's head, then tells the pair that they're headed to Woodbury. Michonne is clearly not pleased to watch them go. Back in the prison, Oscar finds a clean pair of slippers, which almost distracts them while they're attacked by a walker. 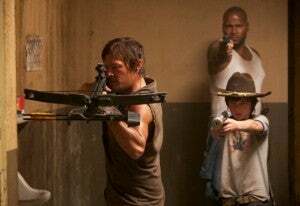 They kill it, and when it falls, Daryl pulls a knife out of the walker's neck that he says is Carol's. Rick stands by the phone as it rings again, this time much more tentative and hesitant to answer, but eventually he does, asking the person on the other end how they know his name. The voice on the other end says that they know him, and that he knows them--that he's been talking to Amy, Dale and Jacqui. Rick realizes that the voice on the other end is Lori's, and begins to sob, saying that he made a deal with himself that he would keep her and Carl alive. Lori tells him that he has to take care of Carl and the baby. She starts asking him something, but the connection breaks up and eventually he steps away from the phone. In the Governor's room, he and Andrea are in the middle of making love when someone knocks at the door. Of course, it's Merle, setting up a hilariously awkward meeting to come next episode. Merle tells the Governor that Michonne is dead--that he had taken her head and her sword as trophies for the Governor's collection but that the others were killed by walkers while carrying those items and Merle couldn't turn back. He does, however, have something for the Governor -- Glenn and Maggie. Merle assures him that he'll find out where the Atlanta group has set up camp. The Governor appears distrustful of Merle, but says nothing and returns to Andrea, telling her nothing of what he's just learned, including that two of her friends are there, and they resume their liaison. Back in the makeshift living area, Rick returns to the Greenes, Carl and the baby. Finally and for the first time, he takes his daughter. Elsewhere in the prison, Daryl is taking the apparent loss of Carol pretty hard, sticking her knife into the floor and wall and kicking things. There's a weak pushing at a nearby door that can't seem to open it, as there's a walker's body in front of the door. Ready for a scuffle, Daryl tears the body away, throws the door open and bursts, knife at the ready, into the room to find a half-conscious Carol hiding out. Daryl carries Carol through the prison corridors as Rick carries the new baby out into the courtyard. Moments later, Rick sees something in the distance and goes to look. A group of walkers has collected at the fence, and walking among them is Michonne, carrying a plastic shopping basket with the baby formula in it. We leave you this week with a performance by Rick's new favorite band.